Etegami of a late-autumn sunflower, bowing down under the weight of the flower, from a photo I took in my neighborhood, at the Park at LeDroit, Washington DC. I’m not a church-goer. I was raised Catholic, grew apart from that, and try to read widely in religion and philosophy to help me be a good person. Often my philosophical reading happens late at night, when I cannot sleep. A recent book I’ve been dipping in and out of is Richard Rohr’s Yes, and… Daily Meditations. This book gathers short essays on 7 major themes, and can be used for prayer, or contemplation of some sort. I like the idea of taking the “but” out of my vocabulary, to adopt the more inclusive “and,” acknowledging that there is no one way be and think. 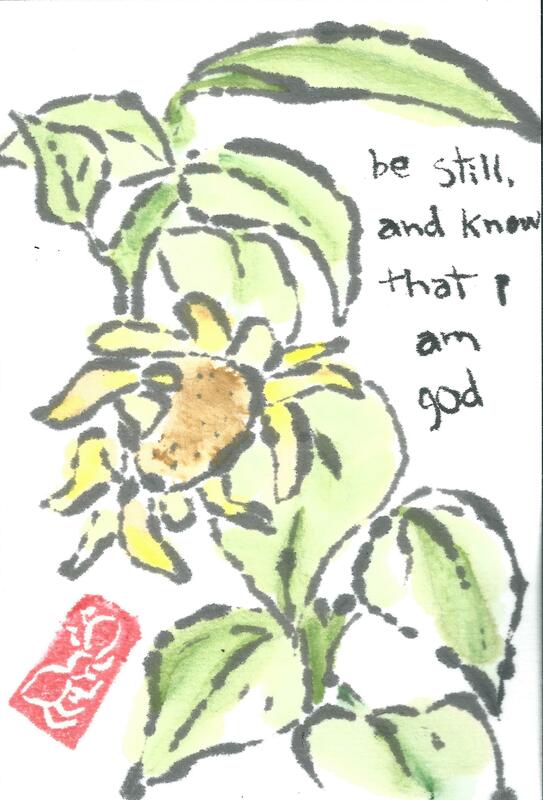 I love his recommendation to break the verse down slowly, starting with it in full, then shortening it to “Be still, and know that I am,” then “Be still, and know,” “Be still”, and finally just “Be.” I use this as a sort of lullaby to help me go to sleep, or calm down. It works for me. I loved all of this. Art and words. Thank you. I never thought of breaking that into smaller phrases. It’s wonderful. Thank you for reading, Mary!